Food is necessary for a happy life, and is a lot of fun to eat. That is why it becomes a tragedy when you accidentally spill food or drink on your favorite shirt. However, some food stains are near impossible to remove from clothes, so you will need to know what method of treatment works with what particular stain. 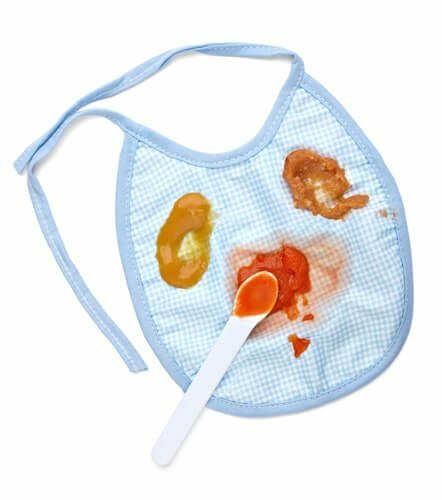 Following is the six worst food stains and how to remove these from any material. At first, it may not seem like a big deal, but over time, a coffee/tea stain will set and become quite pesky to remove. It is important to act as soon as you get the stain, and rinse your clothing in hot water. However, if the stain is an older one, you will need to soak it in dishwashing liquid or treat it with a specialized spot remover. It may sound horrible, but gum stains are actually not too hard to remove. Sure, the stains are messy and disgusting, but here are a few ways you can completely eliminate them. Freeze the area- Try throwing your clothing in a freezer or using a freezer pack for about 15 minutes. Scrape- After the gum hardens, use a butter knife to gently scrape off as much as possible. Soak- Once you have removed all gum, you will need to soak the spot in white vinegar to completely remove the residue. Although it is quite tasty, peanut butter can be less appealing when decorated on your favorite sweater. First, you will need to scrap off the layer of peanut butter and then scrub the spot with dishwashing liquid. Once you have scrubbed, rinse it with hot water, and you may have to eventually use a spot remover. Mustard creates huge stains, so you will need to act quickly. Start by blotting up the liquid and scrap up any tiny bits. Use a commercial spot cleaner treatment and soak the clothing in bleach mixed with cool water. The color of blueberries can be horrible when on fabric. You will need to generously apply dishwashing liquid and white vinegar for 15 minutes. Next, rinse with hot water and quickly wash the clothing. This is one of the toughest stains to remove. It is important to keep the stain from spreading immediately after the accident and using baking soda with salt on a stain like this. Let it sit for 10 minutes, then rinse with club soda. Keep these tips in mind whenever you get a stain on your clothing, and you should have no problem completely eliminating them! What Is The Right Amount of Laundry Detergent to Use? When to Use Hot, Warm or Cold Water ?